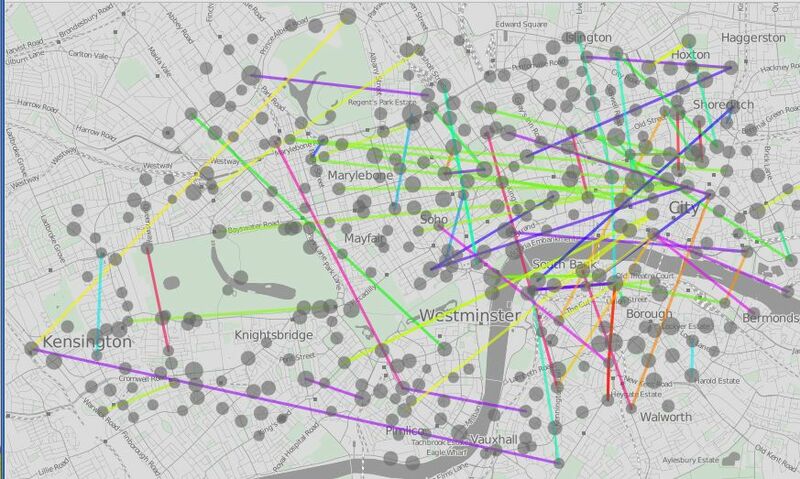 A visualization of initial usage of London's public bike share program, Barclay bikes. The color of the lines indicate direction of flow. Data is from Transport for London. Visualization by Oliver O'Brien. If the past decade is any indication, mobility and technology are becoming more and more intertwined. To improve efficiency and usability of services, transportation agencies as well as transit users have been increasingly leveraging information technology and network tools. “Megacities on the Move” says that “people are becoming increasingly comfortable accessing services, information and social networks online,” highlighting cities like Seoul where “a personal travel assistant app” gives “real-time transport information.” The report showcases a few interesting solutions like teleconferencing and real-time communication between vehicles. Yet existing and widely used technology and data have still have yet to realize their full potential. Cell phones have become ubiquitous and access to the Internet has become more easier through improved applications and social networks. City dwellers and service providers should take advantage of the diverse opportunities of information technology (IT). IT can improve users’ access to transit information as well as riders’ access to transit agencies themselves. In a number of cities, mass transit users can access real-time information on bus and train times and bike sharing locations (and the number of bikes at docking stations). Transit users can also map out their routes via mass transit online or use a cell phone. At the same time, transportation providers are trying to become more transparent and proactive in their operation of services rather than simply reacting to negative customer feedback. It is not uncommon for agencies and mass transit users in the U.S. and Europe to tweet feedback, traffic accidents and service updates. (Washington D.C. is a good examples of transit agencies using information technology. A blog and twitter feed from the District Department of Transportation are useful tools that complement the Metro Office of Long Range Planning’s blog about plans for Metro in the next few decades. There’s even a blog called Struck in DC that seeks to keep the public informed about how frequently area pedestrians and bikers are struck by motorists. for pedestrian and bike accidents in the District). India’s flagship and first bus rapid transit (BRT), a system in Ahmedabad called Janmarg, is also no stranger to this sort of design. All of the buses are equipped with GPS and utilize a central control and dispatch system. And there’s new modes of getting around that exist simply because the technology has improved. For example ride sharing is easier due to new technology. Mobile phones “know” the riders’ location as the software searches for a driver with compatible travel plans, making ride sharing relatively simple. 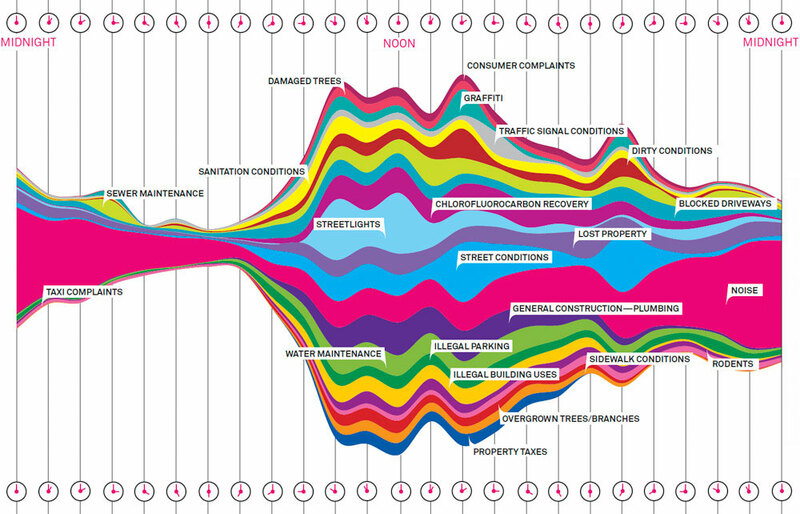 The most common complaints to New York's 311 service between September 8 and September 15, 2010, plotted by time of day. Image by Wired. Another example of improving service for the highest possible number of users on the road is signals that adjust depending on the volume of traffic. One technology, SCOOT, responds automatically to fluctuations in traffic flow through on-street detectors embedded in the road. Also, synchronizing lighting to reduce traffic can have a significant impact on congestion. IBM has taken the technology one step further – it is developing a technology to start and turn off engines at traffic lights in order to improve fuel economy. Tracking and utilizing data allows the city to concentrate resources and target the issues but it is also an opportunity to push a sustainability agenda. When departments, agencies and residents have access to data, that is access to power and the ability to push for a specific agenda. Residents and those working in transportation agencies can utilize the power of facts to explain why a transportation improvement or modal share is preferable. If the goal is to optimize the flow of people and goods and the vibrancy of the world’s largest cities, technology has a key role to play in this process.